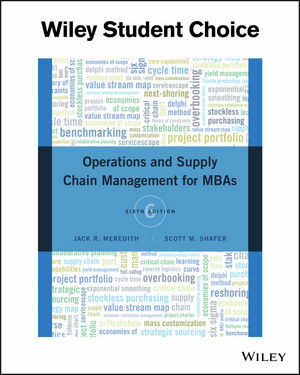 Operations and Supply Chain Management for MBAs, 6th Edition, provides an introduction to the basic concepts of operations and supply chain management with a strategic, conceptual, and contemporary approach. Specifically written with the needs of MBA students in mind, current topics such as supply chain management, the balanced scorecard, and yield management, as well as those specific to marketing, finance and other majors are explained with less quantitative and more conceptual content. With a concise format, this text is designed to allow professors to tailor the course through supplementary cases and other materials for the unique nature of various MBA programs and student populations. • Chapter focusing on demand planning, forecasting, analytics, and sales and operations planning. • Covers introductory, basic, and primarily conceptual material allowing professors to tailor the course through supplementary cases and other materials for the unique class they would be teaching: executive, evening, full-time, short course, and so on. • Contains examples featuring services organizations and international companies to engage and prepare students for the nature of the global economy.